The example uses Google Tag Manager variables with the purchase call, which is part of the Sailthru.integration() function. This call should be made when a user completes a purchase, submitting an array of all purchased items. This will cancel any scheduled cart reminder email, and decrement stock levels if they are synced with Sailthru. All parameters available for a cart update in the Purchase API are available for use with this function, as well. Required parameters are email and URL or SKU. For this example we’re just going to use a simple “Complete Purchase” button click to initiate the call. The purchase function automatically reads the value of the sailthru_hid cookie to identify the user. If you’re using Chrome you can install the extension Edit This Cookie to check/edit cookies during testing. Include the following code on your site. In Google Tag Manager, click New Tag, then change the tag’s name from “Untitled Tag” to “Sailthru – purchase”. Remember those IDs that you set on the HTML elements? Now’s the time to use the button and its ID to trigger the firing of the tag. We will instruct Google Tag Manager to listen for any click events that happen on a HTML element with an id of sailthru-purchases (your form button). Select the options Click ID and contains, and enter the ID sailthru-add-to-cart in the last field. The sailthru_hid cookie will be present in the user’s browser after they have clicked a link to your site in an email. For testing purposes, you can click such a link, or set the cookie value manually with the EditThisCookie browser extension. Each Sailthru user has a static ID that is used. You can find the value for your test user with the Sailthru API test tool. Log in to your Sailthru account at my.sailthru.com, click the settings icon, and click API Test. 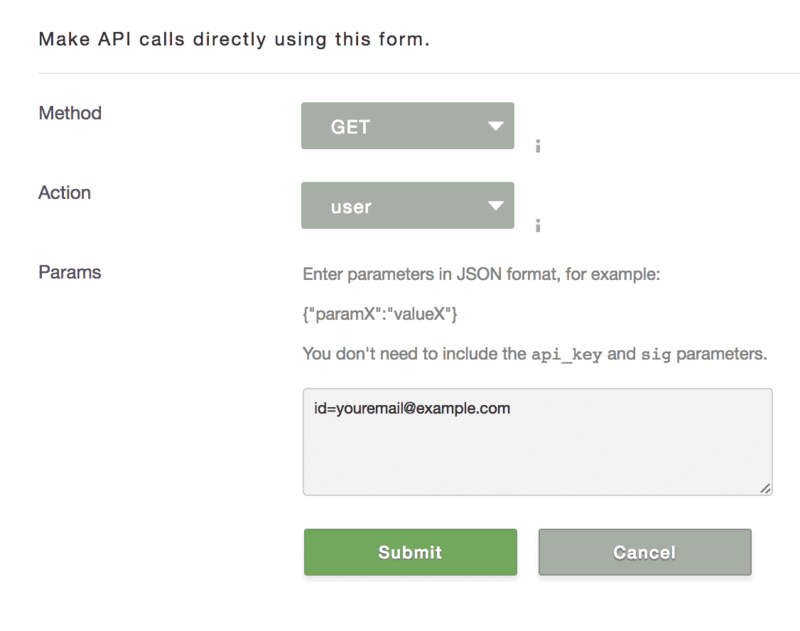 Then make a GET request for the user API endpoint, specifying a test email address. If the test user does not yet exist, you can make an identical POST request first. Once the cookie exists in your browser, open your test site and click the Complete Purchase button. Then, in My Sailthru, open the test user profile (by searching for the email address in the top-right field) and you will see the example product in the “Purchase History.” Also, if you had previously tested adding this item to the cart, it will no longer appear in the “Incomplete Purchase Cart” section.